In her article, “The Essential Resource for Green Family Life: Healthy Child Healthy World“, Jennifer Lance mentioned the Healthy Child Healthy World’s advice on getting rid of Teflon in your kitchen. Teflon is the DuPont brand name for polytetrafluoroethtylene, or PTFE, a type of PFC that is used as a non-stick coating for most cookware. A PFC means that it is a chemical compound composed of fluorine and carbon atoms If you walk down the aisle at any store that sells pots and pans, or even in your pantry at home, I am sure you have noticed those wonderful non-stick pans that make cooking and clean up a breeze. Yes, they are wonderful because you do not need to use as much butter, oil, or whatever else you add to prevent food from sticking to the pan but have you ever wondered what happens as that nonstick coating scratched? What exactly is it that you could be adding to your food? PTFE is made with perfluorooctanoic acid, or PFOA, which the EPA has begun investigating because, “it is very persistent in the environment, it was being found at very low levels both in the environment and in the blood of the general U.S. population, and it caused developmental and other adverse effects in laboratory animals” (EPA article on PFOA). Not exactly something you want to add to your diet. Not long ago Robin Elton wrote an article titled, “PFCs May Impact Fertility”, I think the title of the article speaks volumes on the danger of conventional non-stick coatings for women of childbearing age, but the danger does not end there since PFCs are considered a “likely carcinogen” by the EPA. So, the next time you start cooking up dinner what should you use? With the economic decline people are starting to rediscover the joys of cooking and baking at home. People are even beginning to growing their own vegetable gardens as mentioned in a a recent article from the Associated Press, “Dollars from Dirt: Economy Spurs Home Garden Boom”. So what is a home cook to do knowing that Teflon is a danger to everyone’s health? Glass, there is a lot of bake ware and even some pots are available in glass and it is very durable. Stainless steel, which is easily cleaned although beware that discoloration can occur with high heat and pitting can also occur with extensive contact with salt water. Cast iron is a durable option that when cared for properly can last a decade and sometimes longer, I know my parents still have their cast iron skillet and dutch oven after all this time. To find out how to care for cast iron I suggest visiting Lodge Cast Iron Cookware’s website they have care instructions for various styles. You can even season an old cast iron pot that you find at a thrift store to make it as good as new as long as there are no cracks or nicks in the surface. Pyrex bake ware, which a blog entry from Healthy Child Healthy World notes is “completely nontoxic and made from abundant natural minerals”. And now many companies including Cuisinart, which has their Green Gourmet line of pots and pans, and Green Pan, with Termolon coating, are making pans that have non-stick coatings that do not contain PTFEs. While the cost of new pots and pans can be daunting, the price is easily paid off when you choose to cook at home and this savings can be increased by choosing to grow your own produce. Just think of the possible healthcare savings by preventing contact with dangerous chemicals. You can also begin to consider the beauty of knowing the ingredients going into your meal and instead of it being prepared by a stranger in a restaurant that the meal has been made with love and care in your home. Scanpan makes one they tout as “green” – I don’t know the specifics though. Ceramcor Xtrema is a glazed ceramic that is touted as non-stick as well. Awesome, thanks for adding more to the list! I know a lot of the companies that are using the non-toxic non-stick pans are using ceramic like coatings. WHY is this called GREEN? This is absolutely misleading. 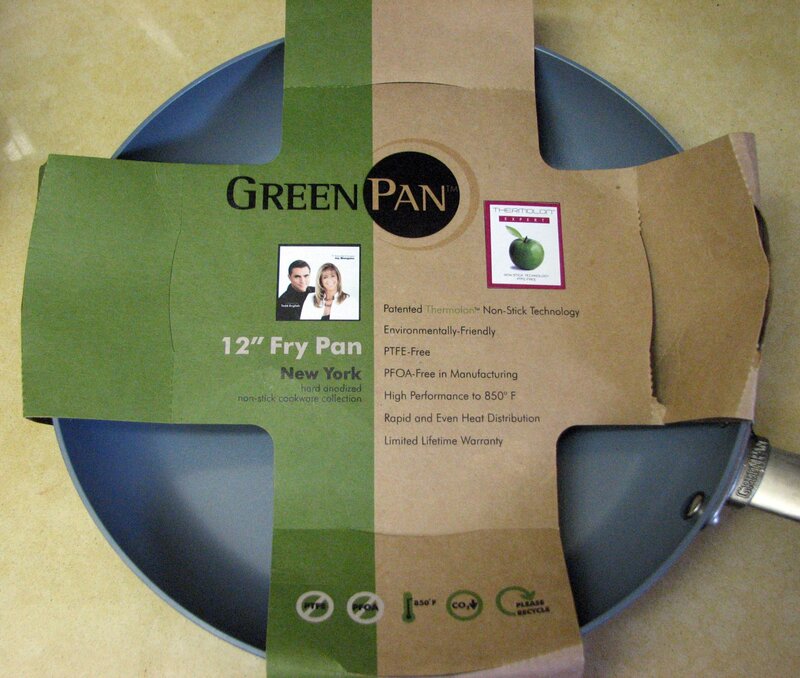 This pan does look safer than teflon ones, according to their website.But why does it have to be GREEN? And is there an independent analysis of these products, are they really safe? I think that the company that produces this product line purely speculating on the Green fashion. I suspect a case of greenwashing here, sorry. 33 years after my marriage I’m still using a cast iron pan that my mother used back in the 1960’s and even before that. I’m not at all sure she didn’t get it from her mother. Well seasoned cast iron is pretty durable stuff, unlike the teflon pans that don’t last even a decade. I switched to cast iron a while ago and couldn’t be happier. When seasoned properly and cared for, they are non stick as well, but without the harmful chemicals. I don’t think you need to buy any special cast iron pan in order for it to be green. Just a simple $15 cast iron pan will do just fine. Andy, I am sure to a large extent it is called Green Pan for marketing, although their packaging is made with recycled materials. On Green Pans website they do state that the making of the Thermolon coating does release up to 60% less carbon emissions. More important then them calling themselves green is the health risk from Teflon type coatings. The problem with PTFE is it starts to degrade at 200 degrees Celsius (500 degrees Fahrenheit). Thermolon is derived from minerals, as opposed to man made materials, and while not everything in our environment is safe for our health, I would like to think if it is being derived from natural sources it is probably safer then something cooked up in a lab. I have not been able to find out much more about the manufacturing process, if I find more I will post it here. Chris, I accidentally typed chlorine instead of carbon, it is a combination of carbon and fluorine. I apologize for the typo, and have fixed it in the article as well. And while you may have a point, I don’t know anyone who eats microwave popcorn, we cook it on the stove top, so I never really thought of it as a source. I appreciate the input though and thanks again for catching my ridiculous mistake. “Thermolon is based on Sol-Gel technology. Mineral materials are derived from the earth. Such materials as used in Thermolon are completely food-safe and have been used to form ceramic items like pottery and glass. Also the Thermolon coating is stable up to 450 degrees Celsius (850 degrees Fahrenheit). I hope the additional information helps. Personally, I am a bigger fan of cast iron and stainless steel. Again thank you all for the comments, I appreciate it. Eco Friendly Family Vehicles: Urban Legend?